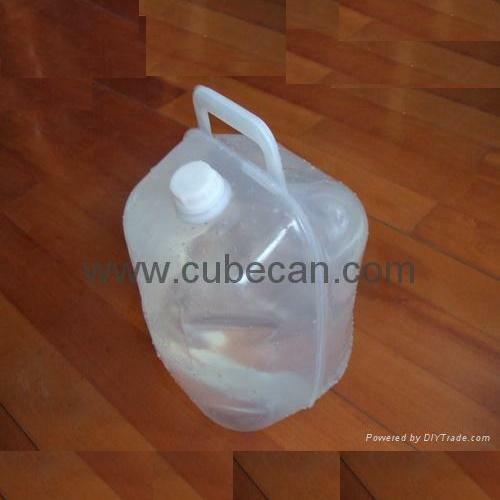 10L Semi-Collapsible Jerrycan manufactured of food grade LDPE. - Jerrycan suitable for drinking water, with built-in handle without sharp edges, wide enough for a male adult hand. - Handle to be situated in the centre of the top of the standing jerrycan. - Material used must be tested by recognized laboratory for potable water purposes, to withstand drop from minimum 2.5 meters containing maximum volume of water at 25 degrees cent. - Must stand by itself, even when filled with less than ¼ of its maximum volume. - Operating temperture -20 Celcius to 50 Celcius. - Average thickness approximately 0.6 mm. Minimum corner thickness 0.5 mm, screwable cap fitted on jerrycan and linked to container by polyamide string with diameter of minimum 1 mm and approximately 120 mm length. - Inner diameter of cap approximately 35 mm. Weight approximately 190 – 230 grams.